“Undergoing a session of colon hydrotherapy allows comfort and cleansing with no toxicity. Techniques utilized allow a small amount of water to flow into the colon gently stimulating the colon’s natural peristaltic action to release softened waste,” Dr. Gerber advises. “The inflow of a small amount of water and the release of waste may be repeated again and again. The removal of such waste encourages better colon function and elimination. “The benefits of colon hydrotherapy extend all the way from psychiatric improvement to constipation elimination,” Dr. Michael Gerber affirms. Thirty years ago, Leonard Smith, M.D., of Gainsville, Florida, graduated from medical school and eventually became board certified in general surgery by the American College of Surgery. For more than 25 years Dr. Smith has practiced as a specialist in gastrointestinal surgery. He has dealt with all types of colon difficulties, including operations for colon cancer, colon diverticulitis, appendicitis, hemorrhoids, and numbers of other internal organ problems. “I am very well acquainted with the colon’s functions, and my true belief is that colon hydrotherapy is the perfect cleansing medium for preparing the patient for colonoscopy. It’s a much better way of getting the human colon ready for an operation than having a patient swallow a gallon of that presurgery solution known as ‘Colon- Go-Lytely.’ Instead, colon hydrotherapy allows the patient to avoid this solution’s noxious side effects of vomiting, diarrhea, abdominal cramping, and other troubles,” Dr. Smith says. Located in Millburn, New Jersey, as a primary care physician for nearly 26 years, Sharda Sharma, M.D., dispenses medical care of a multi-disciplinary nature to her patients. Dr. Sharma employs colon hydrotherapy, chelation therapy, massage therapy, acupuncture, Reiki manipulative therapy, and much more. She treats the body as a whole (holistically). In practice for over 60 years as a specialist in urological problems for both men and women, Emil S. Sayegh, M.D., of Chesapeake, Virginia, is 88 years of age. Over the six decades of his medical practice, Dr. Sayegh has been consulted by a particularly large number of male clientele who have sought his help in correcting BPH and prostatitis. “Silicone breast implant exposure which results in disease symptoms responds very well to colon hydrotherapy. I am in the center of this silicone breast implant controversy by having consulted with over 500 women from around the world for the toxic exposure caused by such implantation. I’ve given testimony as an expert witness before the United States Congress on this issue along with advising the Department of Health and Human Services, the FDA, and consultants to the President, the Vice-president, the Director of Women’s Health at the White House, and the United Nations. I use colon hydrotherapy for the treatment of such silicone toxicity, since it does work to chelate silicone out of the body,” states Dr. Brawer. “Let me explain. inside. Thus, the disease symptoms derived from silicone toxicity is not dependent on envelope rupture. Symptoms begin immediately! In other words, the molecules of silicone travel through the membrane osmotically and become microdispersed throughout the body by means of the lymphatic system,” explains Dr. Brawer. “Now realize that the connective tissue or collagen in each person’s body requires silicone as an essential component in order to provide the body with proper architectural structure such as for tendons, ligaments, nerve sheaths, and everything else. Silicone makes up the glue which holds the skin together, gives substance to the organs, act as regulators, signal transmitters, and so forth. It functions as an integral part of metabolism and physiology. Thus, all tissues are dependent on silicone as an essential ingredient,” Dr. Brawer says. “But given in excess as a leaking silicone breast implant, there is only one place the excess may be dumped or stored by the body – into its connective tissue. When that happens a whole litany of complaints occur: joint pains, dry eyes, fatigue, memory lapses, skin rashes and pigmentations, chest pain, muscle aches, drug intolerance, odor and smell sensitivity to hair sprays, room fresheners, deodorants, and more. From its home office located in San Antonio, Texas, literature furnished by the International Association for Colon Hydrotherapy or I-ACT (see the Resource section) defines colon hydrotherapy as a safe, effective method of removing waste from the large intestine, without the use of drugs. By introducing pure, filtered and temperature-regulated water into the colon, the human waste is softened and loosened, resulting in evacuation through natural peristalsis. This flushing process usually is repeated a few times during a therapeutic session. Colon hydrotherapy is best used in combination with adequate nutrient and fluid intake as well as with exercise. The modern and sophisticated technology applied today, manufactured through compliance with strict FDA guidelines, promotes both safety and sanitation of the procedure. patients undergo colon hydrotherapy the morning of a colonoscopy. It’s a safe way to cleanse the gut. It’s a healing technique for the relief of irritable bowel syndrome with gas and bloating, chronic constipation, abdominal discomfort, and many other GI tract problems. maintain that one should do whatever it takes to keep up with regular bowel movements. Colon hydrotherapy is a safe and natural laxative which works better than any other type. “In Reno, I refer my patients who are in need of bowel cleansing to a colon hydrotherapist. The only reason that I don’t refer people on a regular basis is because most of them come to see me from out of town. Therefore, I tell them to use the services of a skilled colon hydrotherapist located in their area so that they can go for treatment often,” says Dr. Christopher J. Hussar. take colon hydrotherapy was just yesterday. There’s hardly a week that goes by which does not see me utilize this treatment for one or more patients. The colon hydrotherapist in Reno is skilled and does a fine job. hydrotherapy as my beginning treatment for detoxification, particularly for patients with congested bowels. While I focus on the gastrointestinal aspects of colon hydrotherapy, I also prescribe it for the treatment of allergies, arthritis, and other health difficulties. warm water and gradually decreasing the water temperature as treatment continues. This lower temperature tends to stimulate the bowel muscles. The cold temperatures cause good peristaltic action for a retraining of the bowel. MS, of Mandeville, Louisiana. Dr. Carter is Professor and Head of the Nutrition Section at Tulane University School of Medicine. Colon hydrotherapy is taught at eighteen schools located in various regions worldwide. 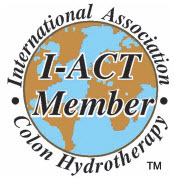 The schools are approved by the International Association for Colon Hydrotherapy (I-ACT), located at Post Office Box 461285, San Antonio, Texas 78246-1295; telephone 210-366-2888; teleFAX 210-366-2999; Email: iact@healthy.net; Website: www.I-act.org. 1. Bettman, O.L. A Pictorial History of Medicine. 2. Kellogg, J.H. “Should the colon be sacrificed or may it be reformed?” JAMA LXVIII (26): 1957-1959, June 30, 1917.